The Sun Storage J4500 array is a JBOD (Just-a-Bunch-Of-Disks) enclosure that connects to x64 or SPARC architecture host servers through a supported SAS (Serial Attached SCSI) host bus adapter. The array normally comes fully loaded with 48 SATA hard disks supplying up to 48 terabytes of storage. It contains SAS expanders—switching circuits that can connect disks in complex patterns to all 48 SATA disks. The array supports SES (SCSI Enclosure Services) based management to identify components, read sensor data and log alerts. See the SUN J4500 System Overview and J4500 Service Manual for more detailed information. - All 48 SATA hard disk drives must be present and the same size. The array enclosure drive bays must be fully populated. Do not mix drive capacities in the array enclosure; however you could, for example, have one J4500 populated with 750 GB SATA drives and a daisy-chained J4500 array with 1 TB SATA drives. The J4500 array does not support SAS drives. - On 03/08/2013 SUN announced support for the mixing of Seagate and Hitachi drives of the same size within a J4500 system. See the Disk section of the Sun Storage J4500 Array Components List in the Oracle System Handbook for more information. iStorage Networks stocks SUN J4500 disk drives. 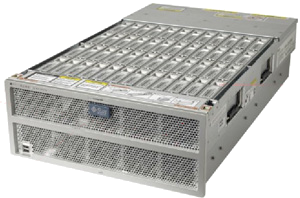 J4500 Chassis, Controllers, Power Supplies, and other Customer Replaceable Units (CRU/FRU) are available. Contact us if you need quantity discount pricing, availability, or integration assistance for your SUN J4500.